At that point Moncler tapped Jean-Philippe Delhomme to make a progression of Alpine-propelled prints for its A/W17 gathering, the French craftsman’s outlines went up against a commonly flippant influence. ‘The brand referenced a couple of ski resorts, similar to Cortina, St Moritz and Gstaad. I concocted characters and situations based around the overabundances of skiing,’ Delhomme clarifies of his snow-topped social parody. In one scene, cafes chugging champagne look as an energetic holidaymaker takes off mid-ski hop over their table. In another, a fur garment and cap clad visitor lands outside the ridiculous turrets of the Gstaad Palace lodging, a miniscule wiener canine in a Santa equip close by. The gathering is the second in Delhomme’s ‘Postcards’ arrangement for Moncler, which appeared for S/S17 with outlines propelled via ocean side goals, from Venice Beach to St Tropez, sprinkled crosswise over tops and bathing suit. This season, his clear brushstrokes are carefully imprinted onto puffer coats and T-shirts, while his nose plunging ski jumpers additionally take off over the chests of sewed jumpers. ‘The brand’s history starts from the mountains,’ explains Remo Ruffini, Moncler’s chairman and CEO, of the collaboration’s theme. Founded in 1952 in Monestier-de-Clermont, near Grenoble, Moncler began as a purveyor of sleeping bags and tents, before launching its now ubiquitous down jackets two years later. It soon began equipping explorers for expeditions in sub-zero climes. ‘This DNA has been maintained and enhanced,’ says Ruffini. 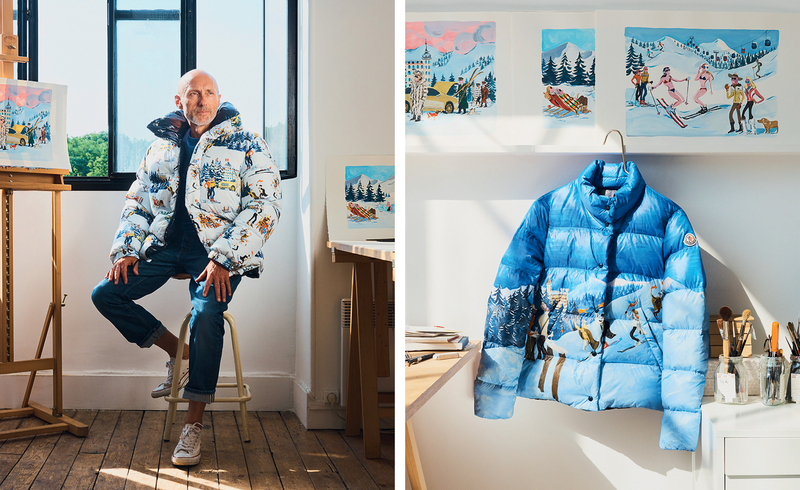 While the new illustrations have a less intrepid and more après ski-centric focus, they ‘perfectly match with the creative soul and sporty ethos of the brand’, he adds. Renowned for his fashion illustrations, first published in Vogue in the 1980s, Paris-based Delhomme has also created advertising campaigns and written illustrated novels. His witty sociological gaze has fallen on arenas from art to architecture (his 2015 book on Le Corbusier’s Villa Savoye offers a visual narrative of the architect’s relationship with his clients, Pierre and Eugénie Savoye) and he illustrated our Architects’ Directory and newsstand cover in 2015.